Thanks to Nostalgia Products Group I got to review their Electric Lazy Susan Buffet Server! I was excited to try this out! I love that it is stainless steel and looks so nice! It's great that this appliance breaks down to a warming tray, large buffet pan, and also has four separate covered dishes! I really like that it has a heat-retaining stone to keep your food warm! Nostalgia Products Group, LLC, designs, manufactures and markets the Nostalgia Electrics brand of small electric appliances. Nostalgia Products Group, LLC also develops a wide range of innovative products to excite consumers and retailers alike, such as the new Electric Lazy Susan Buffet server food warmer. Their products are sold through all major channels of distribution from both within the United States and worldwide. Internationally, NPG products carry the GS and SSA electrical approvals. They ship to over 30 countries worldwide. Nostalgia Products Group introduces its latest innovative kitchen appliance. 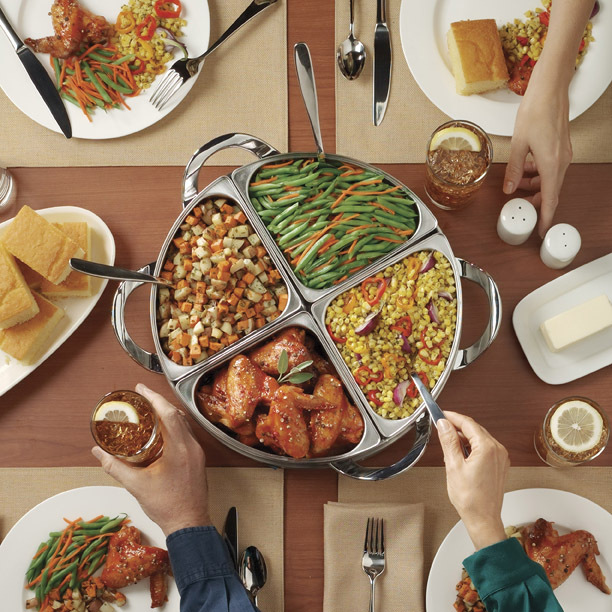 The stainless steel 3-in-1 Lazy Susan Buffet server is a food warmer that works even when unplugged, but also cooks food, which makes it ideal for the busy holiday meals. Nostalgia Products Group, LLC is pleased to introduce the first Electric Lazy Susan Buffet™ server. This innovative food warmer has a stone inside its base that retains heat so food stays warm for up to an hour after the cord is detached. 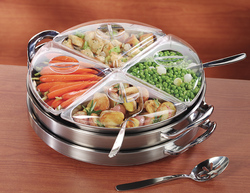 With the Electric Lazy Susan Buffet™, the possibilities for serving are virtually endless. The appliance breaks down to a warming tray, large buffet pan and four separate covered chafing dishes, giving the user a variety of options for serving. It's like having three units in one. Perfect for breakfast, lunch, dinner, side dishes or desserts, families will love how easy it is to serve themselves off the buffet server as the unit swivels on its base. The chafing dishes can separate to be made part of a beautiful table setting. Crafted of resilient and easy-to-clean stainless steel, this product is designed to provide years of enjoyment. “The Electric Lazy Susan Buffet™ is a kitchen appliance that every family can use. It’s great not just for family dinners, but is also a perfect serving solution for large gatherings like holiday parties,” says Gregg Bond, President of Nostalgia Electrics. give away 1 Electric Lazy Susan Buffet Server! We have a lot of family parties at my house and really could use this! How fabulous! I'd love to win. Love hosting parties -- this would be very fun and useful. Your review of the products is so informative. Thank you. Hey, why don't you bring this down for the Chinese dinner? We could borrow it! :) I'll let you know when it is. This is really really neat! Oh how I need this! What a great idea. and I follow your book blog too. Oh - since I blogged I do 4 more right? I really want that lazy susan - to match the rest of my lazy family - har har! OK - last one...I did go try to vote, but I don't know how, unless just going there did it, then I did vote for you!! looks wonderful.... never seen anything like it.. llove it !!! I am following your blog! I love to cook (hence I have a cooking & recipe blog) and have never seen anything like that! love it! I didn't know there was such a thing. It looks like it would be real handy and you wouldn't be embarrased by how it looks! Very cool prize! It sounds awesome - I would love to win. This would be GREAT for our family get-togethers! I don't tweet - but I AM a follower.. I'd love that! Of course I have your botton - because you rock! This would be so useful since I do love to cook and post get togethers. Thanks for the chance to win this cool stuff. I follow your Trying to Stay Calm blog via google friend connect. I also follow your Book Giveaway blog! Tweeted -- *Thanks* for the giveaway!